Fri, Mar 22, 2019, 11:53 pm SL Time, ColomboPage News Desk, Sri Lanka. Mar 22, Colombo: Minister of Industry and Commerce Rishad Bathiudeen says the Wilpattu Forest is an asset to the country and a huge campaign is being waged to falsely accuse him of destroying a national treasure. 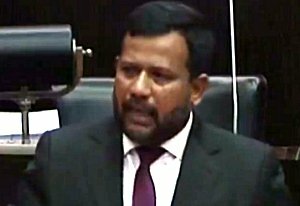 Minister Bathiudeen made these remarks in parliament today responding a statement made by JVP parliamentarian Anura Kumara Dissanayake regarding media reports that the Pulmoddai Mineral deposits are being sold to a foreign company and deforesting of Wilpattu national forest. Speaking further Minister Bathiudeen said a huge lie and accusation are being spread against him that he is responsible for the destruction of the Wilpattu national forest. The Minister said that action was taken to clear the overgrown areas where the displaced people were resettled during the previous Mahinda Rajapaksa government and he was unfairly accused of deforesting the national forest reserve following this act. Speaking further, he said that he did not act to release any inch of land for his people under the present government. He also emphasized that the land belonging to this reserve is an important land of the country. "Those who were resettled in the village were original residents who were chased away by the LTTE. Until 2012 that area was not included in the conserved forest and the lands were released under that condition. These lands were released by a Land Registrar (Kachcheri). After that no land has been released for resettlement, not even an inch," he said. Therefore, he has stated that he would appear in court for any punishment and that he would take any punishment for it, if he has cleared the protected area illegally, Minister Rishad Bathiudeen said. "What these social media is doing is mudslinging. Wilpattu is a treasure of the country. I will appear in any court if the forest reserve is destroyed by me. I have not done anything wrong. I will accept any punishment on behalf of my people. My people are in Mannar district. The Wilpattu is in Anuradhapura and Puttalam districts. This allegation is false," he said. The Minister requested the Speaker of parliament to appoint a parliamentary select committee to investigate the allegation.